Eangee was launched in 2003 when the Shay Elder was vacationing in the Philippines and discovered the gecko lamp that had been crafted by a creator there. After talking with the artist, he returned to the United States and opened a small store with friends and began featuring these hand-crafted lamps. Eangee Home Design prides itself as being a company with a mission to provide eco-friendly, fair trade home goods. Flipped Bird founder, Marci McDonald, has been proud to launch a collection of Arizona-made fun, spirited accessories that appeals to the independent free-thinkers of fashion. 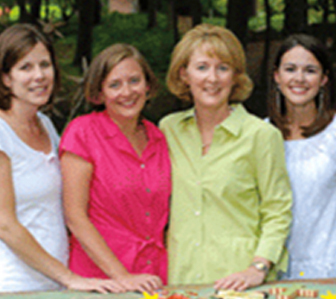 Glory Haus was launched by four friends from Marietta, Georgia in 2008. Their mission is to transform a community that glorifies the Lord and changes lives through work, art and relationships. Their decorative home products are designed with the hope that they will touch your heart, give hope and bring beauty to your home, office or anywhere else you reside. The Green Glass Company based in Wisconsin beautifully transforms bottles that would have normally gone to a landfill into richly colored ,and sometimes whimsical, beverageware. Heather Charlick, Island Cowgirl's founder, discovered her love for making jewelry while attending FIT. Since then she has traveled the world and settled in Nashville where she designs, molds and creates her inspirational silver-plated jewelry. Two brothers, Anthony and Richard, launched their product innovation company in 2003. Their mission is to create high-quality kitchen products that introduce innovation and improved functionality to what many perceive as everyday items. At Look At Me Designs they design, create, and sell one-of- a-kind items. If you are looking for a unique accessory and want to make a statement, then they have something that will fit your individual style. When you wear one of their signature pieces you can be assured that no one else in the world will ever have the same item as you. Meadowbrooke Gourds was launched 20 years ago by Ben Bear. This 'tinkerpreneur' as his wife lovingly calls him, found a new use for a field of dried gourds by turning them into beautiful decorative pieces for the home. Today, Ben, his wife and their three children all work in the business of growing, harvesting and painting gourds on their 200-acre Pennsylvania farm. Primitives By Kathy is the #1 wholesaler of "present day primitives" to nationwide retail stores. With a focus on creative design, ahead-of-the-market product innovation, and international sourcing, the company currently offers over 5,000 unique home décor and gift items to more than 10,000 worldwide customers. Pursecase was launched by fashionistas Jenn Deese and Kellie Coughlin to be equally functional and stylish. When it came to protecting their phones - so central to their careers and lifestyles - compromise was the last thing they were looking to do. So they created a solution. Laura Shields, founder of Yes & Yes Jewelry found her passion in 2010 when she joined Technshop. She was looking for exciting materials to repurpose and landed on a laser cutter and old books. Since 2012, when she launched a Kickstarter for a laser cutter of her own, she has been creating jewelry out of unwanted books. She and her husband produce all products in California. Joshua Lefkowitz created the Zinger after his daily routine of adding fruits and vegetables to water became a healthy experience he wanted to share with others. He thought nothing was more enjoyable and refreshing than creating his own combination of ingredients without anything artificial.